Design and branding consultancy Silk Pearce has just completed a total brand overhaul for one of the largest and most popular full service law firms in Essex. Birkett Long – a regular winner of industry awards for its commitment to clients and excellence as an employer – is bringing a fresh new look to all its communications to better reflect its approach in advising national and international businesses as well as individual clients. The first wave of work includes new stationery, signage, advertising, a re-designed client newsletter, branded giveaways and an updated website. Silk Pearce’s new logo for Birkett Long, pallet of vibrant corporate colours and visual design style have been specifically chosen to tie together the company’s track record and heritage with its progressive, refreshing approach. The firm’s former dark green logo in a chiselled typeface is being replaced with a distinctive symbol in the shape of the letter B with the words Birkett Long printed vertically alongside. The B is in a modern, block-like typeface but is overprinted with a scrolled letter L that divides the symbol into six sections. Although the core logo never changes, it has been created in a flexible format so that it can be re-arranged for a wide range of promotional materials or elements can be used in a playful, illustrative way. For example, Silk Pearce’s redesign of the firm’s client newsletter ‘The Broadsheet’ uses the recognisable B symbol with the word Long underneath. Whereas the scrolled L is being used as a graphic device on the front covers of brochures promoting specific legal services. “Silk Pearce has created a fresh, more appealing and integrated visual style for all Birkett Long’s external communications that can grow and evolve as our needs change. Our management team is delighted with a more contemporary look and believes it will significantly boost our reputation as a major practice, competing in many respects with London firms, but with a creative, flexible and friendly approach,” said Martin Hopkins, business development and marketing partner at Birkett Long. 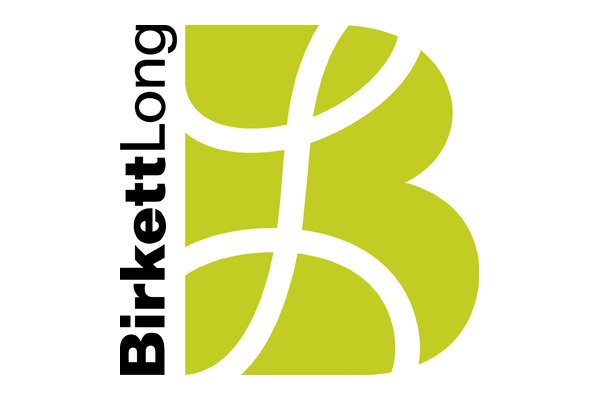 “From the outset is was clear to us as a third party that Birkett Long is extremely popular with clients, staff and within its local communities but its previous corporate identity suggested a much more traditional, very formal approach. Our new logo was deliberately chosen to help shake off the dusty image that is so often associated with larger legal firms and to give the company something that looks equally good on corporate brochures as it does on the company’s T shirts for charity events,” said Jack Pearce, joint creative director at Silk Pearce. In addition to taking an active role in fund-raising and other community activities, Birkett Long has been recognised nationally for its commitment to staff development. In 2007 the company was named 47th in The Sunday Times 100 Best Small Companies awards; and earlier this year was number six in the lawyers’ category in an inaugural survey commissioned by Managing Partners’ Forum to recognise the Top 100 Professional Firms to Work For.